Today I’ve rounded up 35+ Halloween Decoration Ideas! 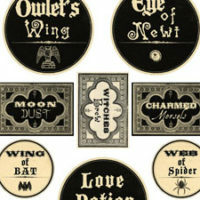 All of these fun Halloween crafts and projects were created using Vintage Graphics from my site. These are mostly projects for Adults, but there may be some where kids could help with parts of it. And the children will certainly enjoy seeing them in your decor. We definitely emphasize fun here in this collection, nothing too horrifying, just a few slightly spooky ideas and plenty of cute ones. Some of these projects were created by me, some by my contributors and some were submitted by readers, so there is a nice collection here from all sorts of crafty folks with different creative styles! I always love putting these collections together, and this one was no exception. 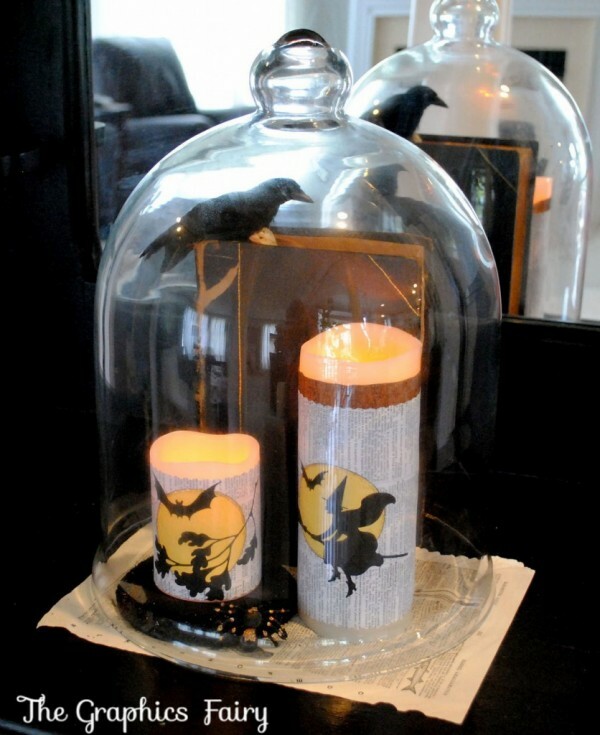 I hope these ideas, projects and DIY’s will help inspire you to create some Halloween Crafts for your own home decor. You can find the first of the Halloween Decoration Ideas below! 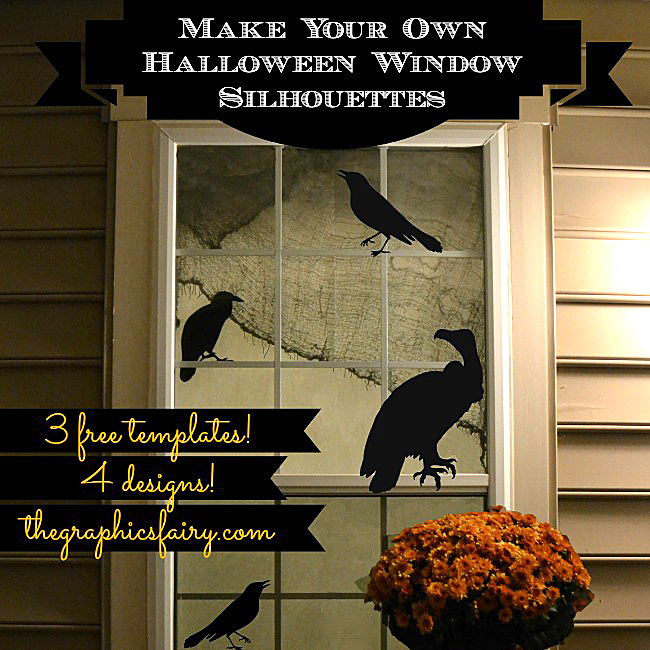 My biz partner, Emily, created these fantastic Halloween Window Silhouettes (Full Tutorial included on the post) that anyone can cut out and use to decorate their windows! They are so cool and spooky (but not too spooky)! Such a great Decoration Idea. 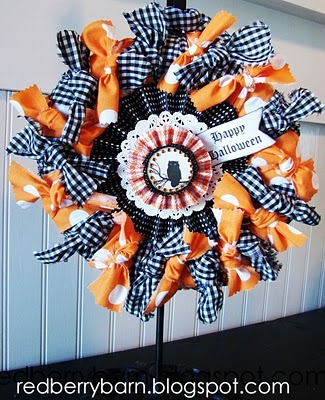 Jen from Redberry Barn made this Halloween Ribbon Wreath using the Halloween Owl Image! This would be so cute on a Front Door. This is one of the coolest Halloween Crafts that I’ve ever seen! 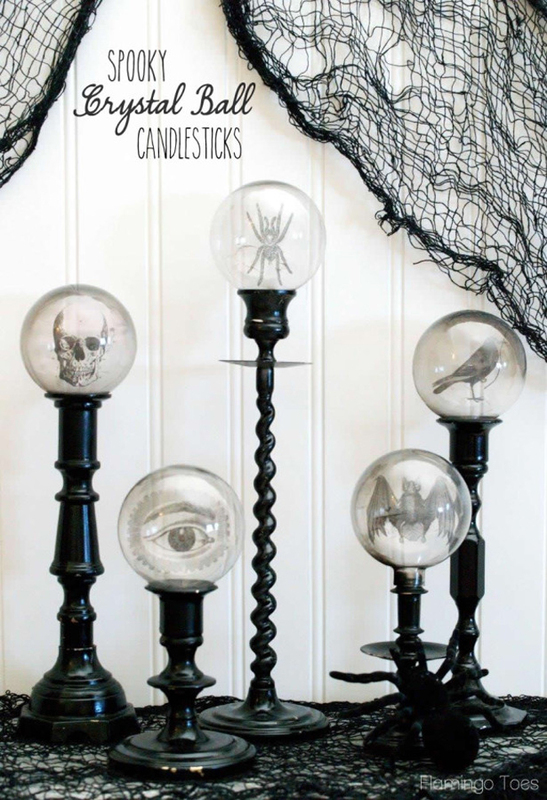 Bev from Flamingo Toes made these awesome Crystal Ball Candlesticks using several Halloween Images! This is one that you will want to display every year, and your friends and neighbors are sure to be wowed by it! You can go HERE for the Printable and info on the tutorial. Here are some more fun Halloween Project ideas by Kelly, from Eclectically Vintage. 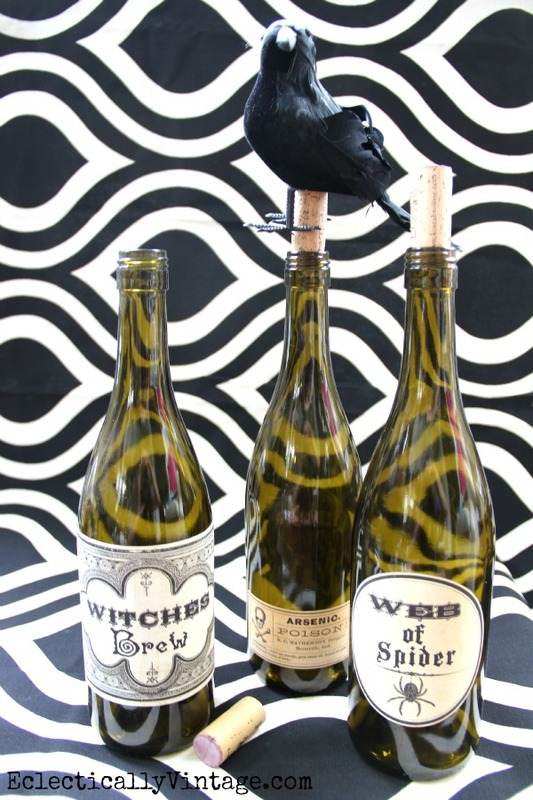 She upcycled some wine bottles and turned them into nifty DIY Halloween Bottles! 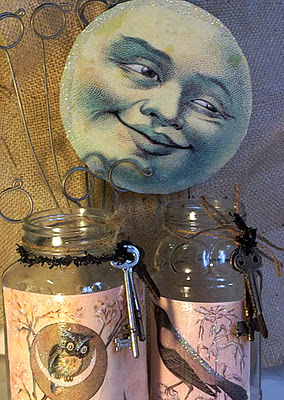 Kelly used the Haunting Potion Images for this amazing upcycle! Last year, I made these fun Halloween Candle Wraps! Click over full the full tutorial and Printables…it’s a super simple DIY Decoration and makes such a fun display for your Trick or Treaters! Gina shared a tutorial for making your own DIY Graphic Pillow using the Witches Ball Printable! This one is so versatile, because you can change out the image. 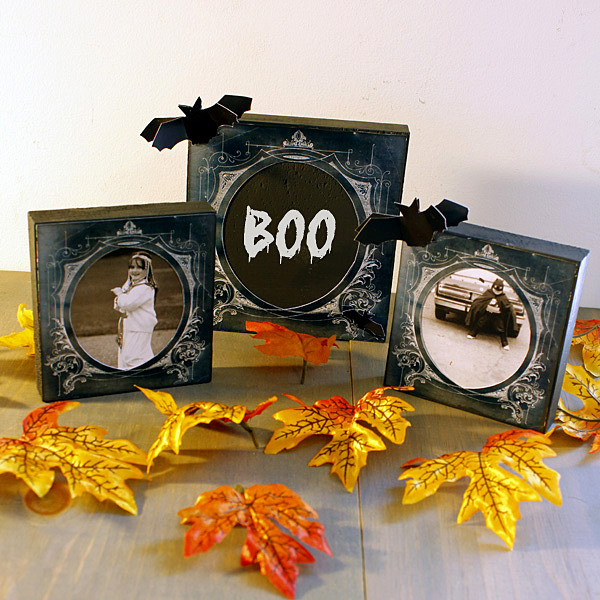 Create these chalkboard Halloween frames easily using some Antique Sheet Music Printables and your own photos too! These are such great Halloween Project Ideas. 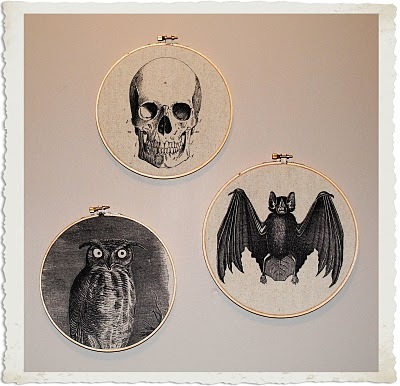 A few years ago I made this cool Halloween Fabric Art using some cool Halloween images and embroidery hoops! Be sure to check out the tutorial and download the images too! 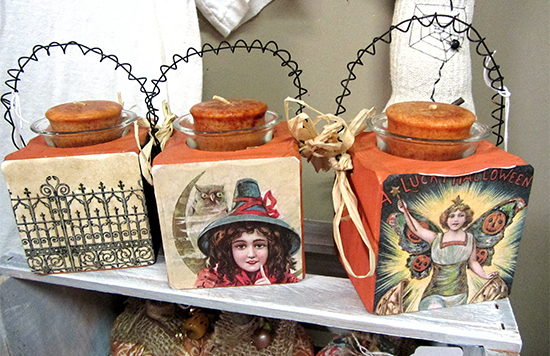 Terry from The Painted Pony made these super cute Halloween Votive Holders using several of the Vintage Halloween Graphics! Such a charming nostalgic display. 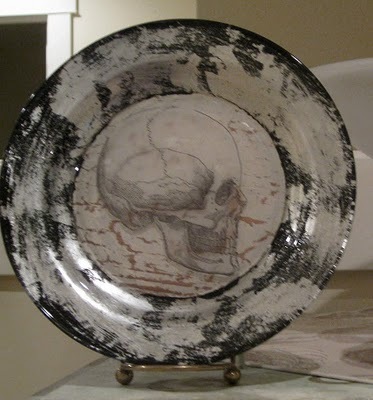 This Spooky Skull Plate was created by Carol from The Answer Is Chocolate using the Skull Image! It has quite an eery look to it, but I love the effect! 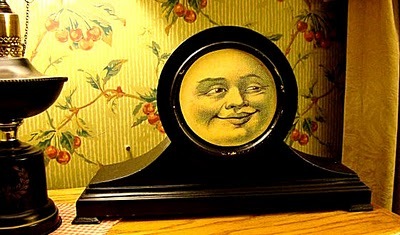 This fun Moon Faced Clock was created by Linda from Itsy Bits and Pieces using the Man In The Moon Face Image! Such a unique and clever idea! This fabulous Halloween Display was created by Mary, from Boogieboard Cottage, she also used the Moon Man Image and some other Halloween Graphics! I love the bits of glitter she added. 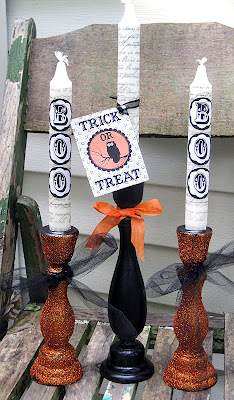 Jeanine from Okio B Designs created these fun Halloween Candlesticks using the Boo Garland and the Trick or Treat Label! Aren’t these so fun? 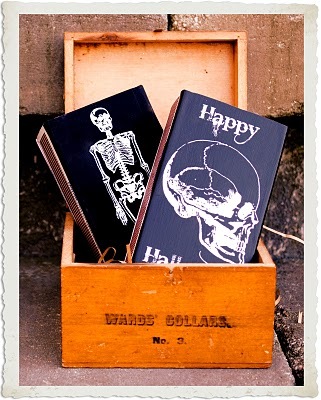 They would be great on a Buffet at a Halloween party or to display in a foyer so your trick or treaters can see them. 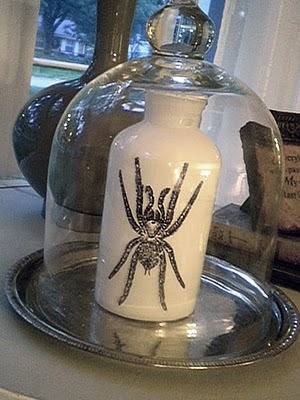 This fun Halloween Spider Bottle was created by Nan at You Could Make That using the Vintage Spider Image! The Glass cloche is a nice touch, as it really shows off the Spider inside. 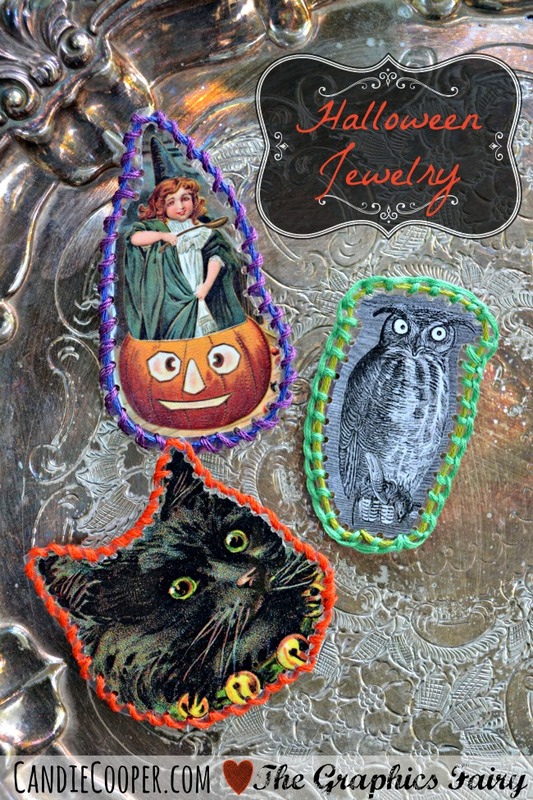 Candie Cooper created this fun Halloween Jewelry using these fantastic Halloween Images! Aren’t they cute? Perfect for giving out to kids as a Party Favor or hand out to Teal Pumpkin kids that have allergies. 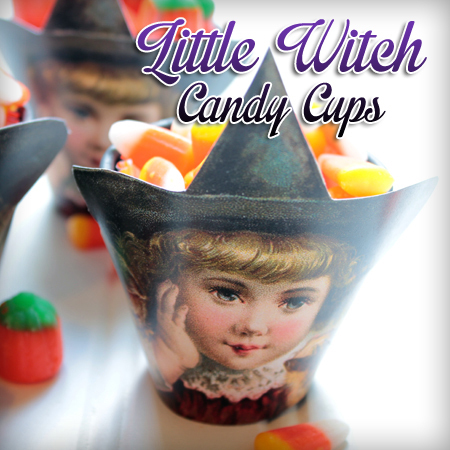 Andrea made these adorable Little Witch Candy Cups using the Little Witch Image! Perfect Halloween Decoration for a party and just right for Candy Corns! 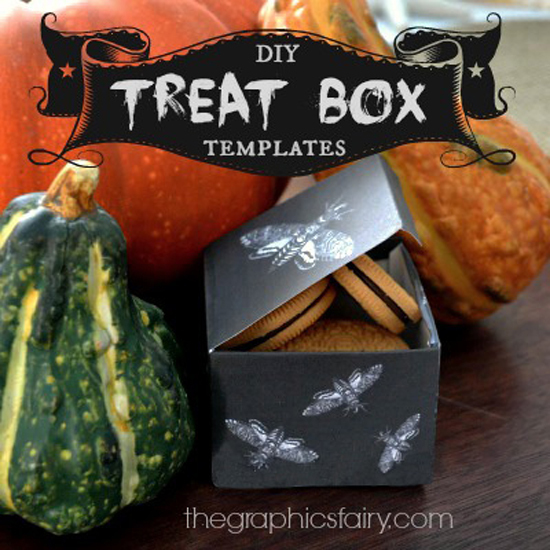 Emily created these darling DIY Halloween Treat Boxes using the Iron Gate Image and Moth Images! This is another Halloween Decoration that’s perfect for a party. You could put Candy inside, or little gifts. I made these cute Halloween Match Boxes! They make a super fun container for little surprises for a Halloween Party! Tutorial and Printable is included on the post. These adorable Halloween Treat Bags were handmade by Beth from Alyssabeths using some of the Vintage Halloween Graphics! Such super cute Halloween Decoration Ideas. 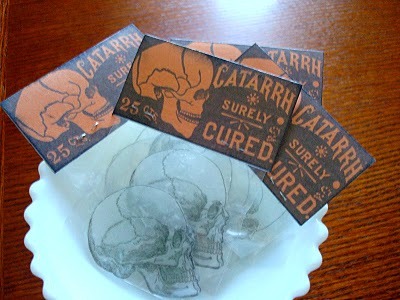 Diana at Closet Crafters created these fun Skull Soaps using the Skull Image! Such a unique and clever idea for a Halloween Party Favor! 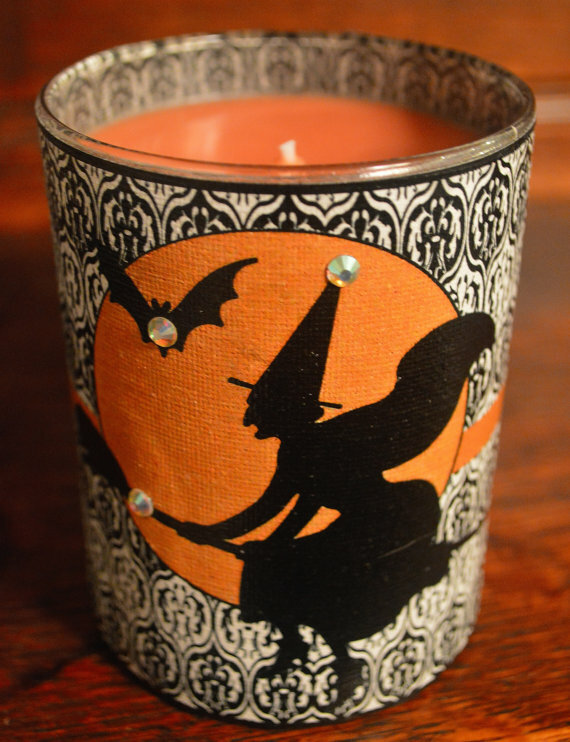 This super cute Halloween Witch Candle was created by Vintage Wicks N More using the Witch With Moon Image! It would be fun to have these on place settings on a Halloween Party Table. 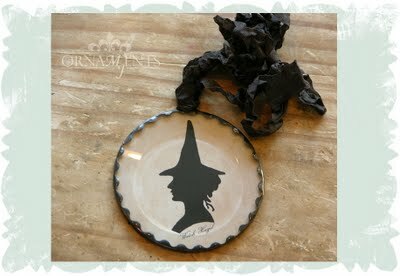 Martha at MJ Ornaments made this super cute Halloween Soldered Ornament using the Silhouette Lady Image! Isn’t it charming? Years ago, I made this Halloween Boo Garland! Click over to download the free printable to make your own! This adorable Halloween Album was made by Ginny from Polly’s Paper Studio using the Witches Ball Printable! So many lovely embellishments on this piece. 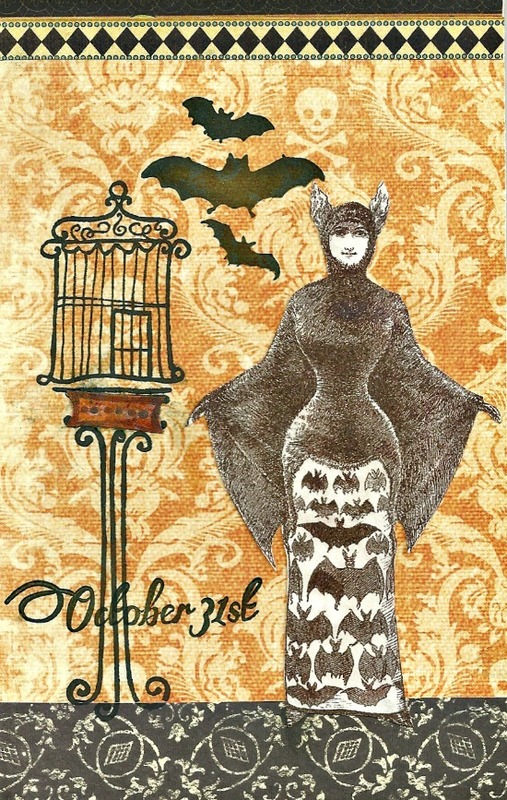 Star McCoy created this fabulous Halloween Collage Art Postcard using the Victorian Bat Lady Graphic! How fun! 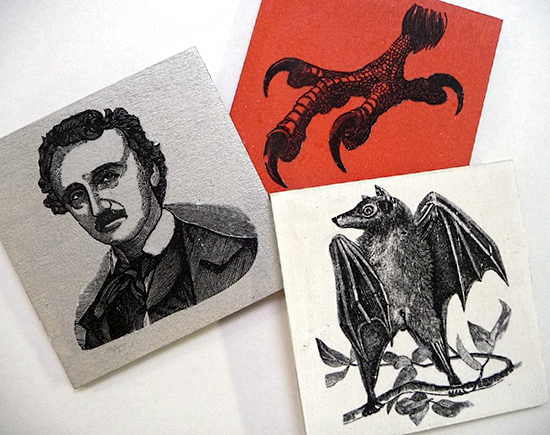 These spooky Halloween Coasters were created by Bella from Art Club Blog using a few of the Vintage Halloween Graphics! Use them for your guests drinks, or place them on an easel to display as mini works of Art. 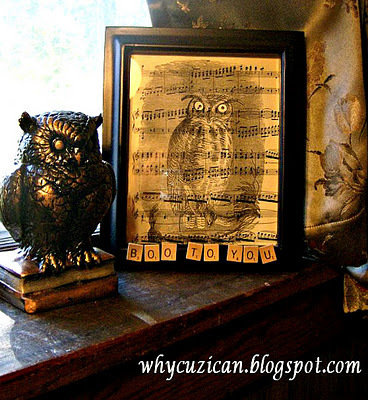 Suzanne from, Why, Cuz I Can Blog, made this fun Halloween Owl Art using the Spooky Owl Image! I love how she used Scrabble tiles for the title, such a clever Halloween Project idea! 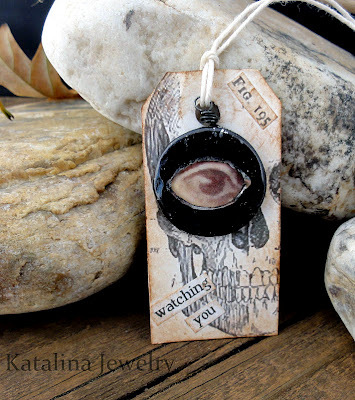 This fun Watching Eye Charm and Tag was created by Kathy from Katalina Jewelry using the Vintage Eye and Skull Image! Quite spooky, but so artistic too. 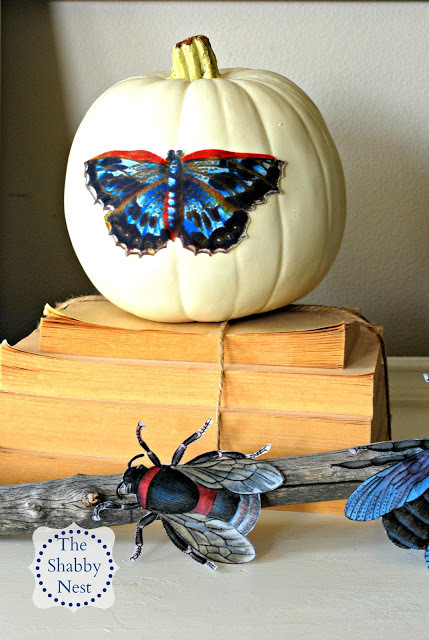 This is one of my all time favorite craft projects that I have done, my Book Page Pumpkin! These are so simple to make and don’t require any special crafting skills! Plus, it’s cute! 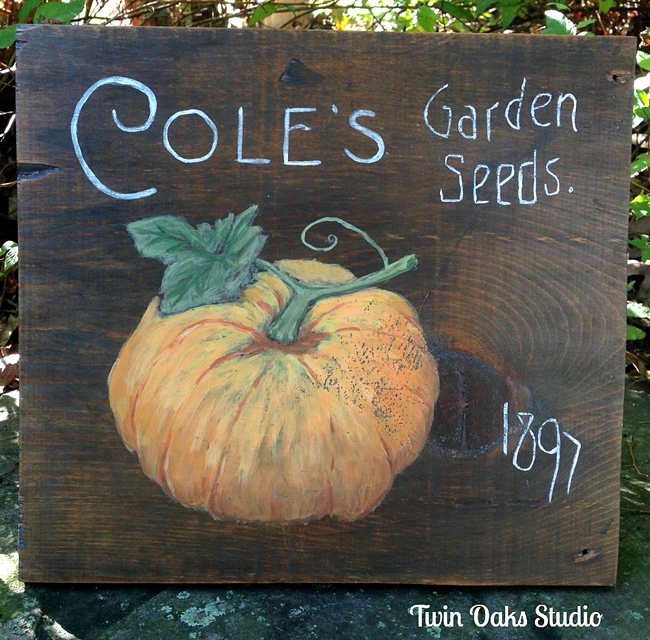 Pauline, from Twin Oaks Studio, painted this amazing Rustic Pumpkin Sign! She used the Vintage Pumpkin Seed Packet Image for her inspiration! 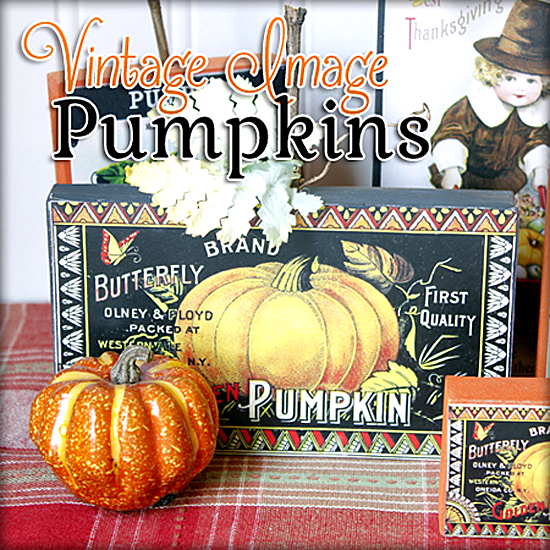 One of my talented contributors, Andrea, made these Vintage Pumpkin Signs! She used the Pumpkin Label, Pumpkin Seed Packet, Pilgrim Boy Postcard, Pumpkin Kids Postcard Image and the Thanksgiving Pumpkin Lady Image to make these fun art pieces! 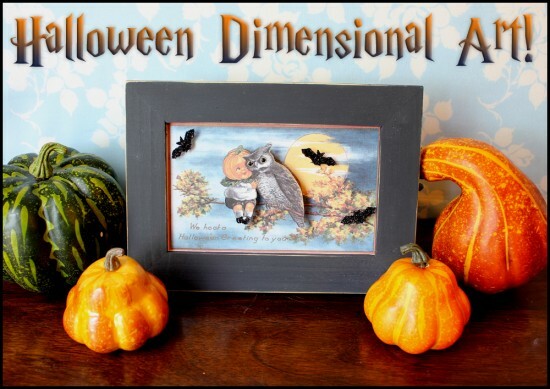 Andrea also make this Halloween Dimensional Art! For this project, she used the Vintage Halloween Image – Cute Pumpkin Boy With Owl! 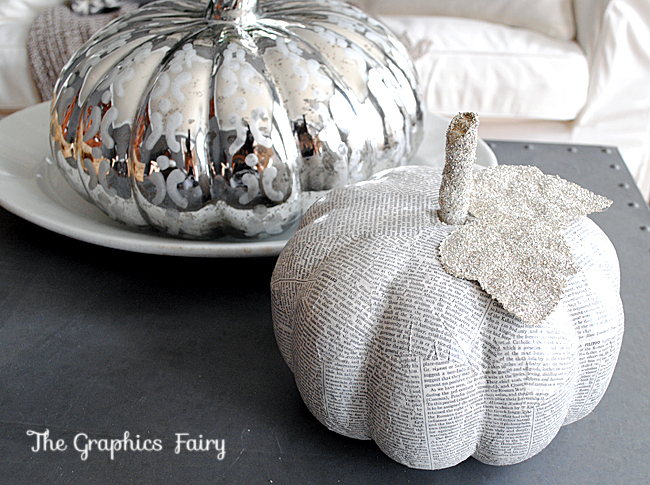 My friend, Wendy, from The Shabby Nest created this beautiful pumpkin! You’ve got to see what she did with her mantle! Here’s a hint…she used the Vintage Insect Graphics and Bug Printable! 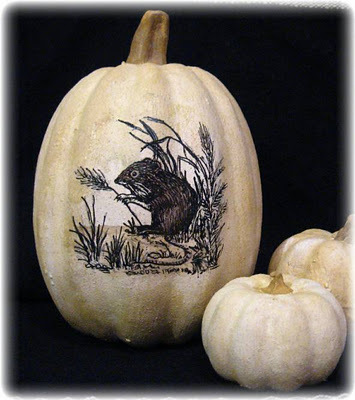 Tonya at Pumpkin Pie Painter used the Field Mouse Image to create this sweet pumpkin! Such a dear display and one that you could use all Fall. 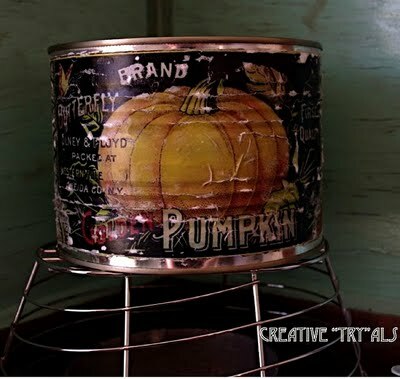 This cute Pumpkin Can was made by Sue at Creative Try Als! 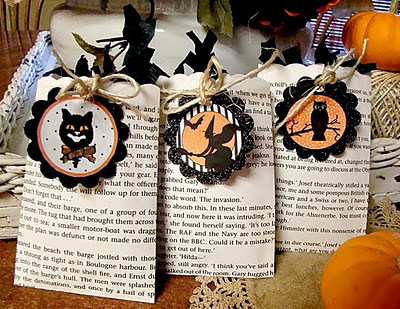 She used the Vintage Halloween Clip – Art Pumpkin Label for this project! I love all the distressing that she did on this. This super cute Halloween Countdown was created by Mrs. Beez! 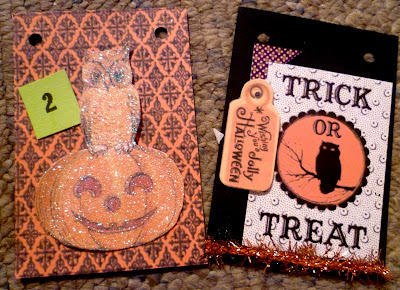 She used the Owl on Pumpkin Graphic and the Trick or Treat Printable! Wouldn’t the kiddos just love to use this! I hope you enjoyed this collection of Halloween Decoration Ideas and hopefully it will inspire you for your own Halloween Crafts and Creations! 12+ Free Vintage Mother’s Day Images! 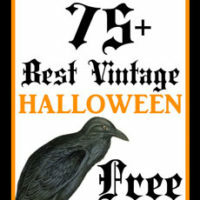 10+ Halloween Printables – Free 75+ Best Free Vintage Halloween Images! 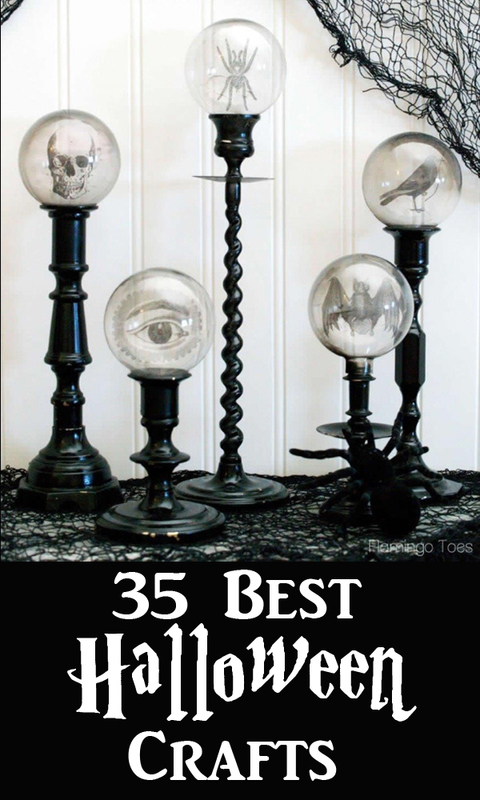 My favorite is the first one with the 5 black candle sticks with the spooky globes! Thanks Pamellia, I like that one too!